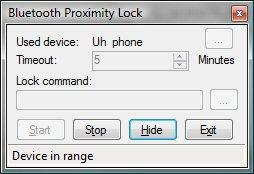 Thanks to Dave Amenta, I found BTProximity for Windows 7 / 8 that can detect when your bluetooth enabled phone has come into rage, and unlock your Computer. Yes, no more hassle of typing lot of password to type when you are near the PC. BTProximit is donationware, if you like it, please make a donation to the developer. Download (Windows 7/8 – x86 and x64): BTProximity for local user account. BTProximity for Domain users download from here.